The transmission tower is a high-rise structure, which is very sensitive to the oblique deformation and has high requirements for uneven settlement of the foundation. The common structural forms of the transmission tower foundation are independent foundation enlarged foundation and pile foundation. 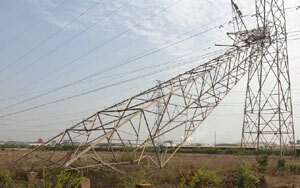 The structural form of the transmission tower mainly adopts steel structure. Conventional transmission towers and infrastructure are difficult to adapt to the surface movement and deformation of coal mine goaf, which may cause the transmission tower to deflect or even tip over. Various human factors and natural factors such as crustal movement, bad weather, aging oxidation and potential vandalism bring safety hazards and rising maintenance costs to transmission towers, resulting in increased stability and availability of communication systems and increased operating costs. Because the transmission line tower carries the gravity of the wires between the two towers, coupled with the influence of many factors in the natural environment and the lack of timely manual management (especially in some mountainous areas), it is very easy to cause the safety of the tower to be threatened, leading to overturning accidents and affecting power transmission. By installing tilt sensors on the power transmission tower, the tower maintenance engineers can get the real-time inclination or tilt status of tower remotely via logging in the online monitoring platform. From the online user interface, maintenance engineers can get the X or Y axis inclination angle of every transmission tower clearly. The tradition tower maintenance relies on the manual field testing via instruments, so there be errors in measurement. By using the inclinometer, this problem can be easily prevented. By using the tilt sensor to monitor the erect state of the tower, maintenance personnel can understand the daily safety status of the tower at home or at office once they have logged in the monitoring system, which greatly reduces the necessity of climbing up the tower for inspections. On the basis of data analysis conclusions, the maintenance personnel can find the location of tower fault quickly, so they can formulate reasonable, proactive and preventive maintenance measures on the data support. The tower maintenance personnel can implement effective operation and maintenance dispatching work, greatly reduce operation and maintenance costs, and extend the service life of the transmission tower. By setting a safe tilt range, an alarm can be issued when the tilt angle reaches a certain value, so the maintenance personnel can quickly check the possibility of a safety accident. In addition, in the event of abnormal tilt caused by wind, snow, landslides and etc., the timely status alarm sent by inclinometer can facilitate the quick recovery of the accident occurrence point and ensure the early recovery of the transmission line. By monitoring the safety status of the tower in real time, it can effectively avoid the occurrence of iron tower safety accidents and improve the continuity and stability of the power supply. According to the practical application occasions of transmission tower, Vigor Technology provides a complete system monitoring solution for transmission tower which can monitor the inclination, wind speed, settlement, vibration and etc. Vigor Technology SST400 digital inclinometer can be installed on the top and body of transmission tower for real-time inclination monitoring. When the inclination reaches to a critical value, the inclinometer will deliver an early warning signal to the transmission tower monitoring system, so the maintenance personnel can get this warning quickly and take effective measures to prevent the occurrence of accident. Shanghai Vigor Technology Development Co., Ltd., founded in 2001, headquartered in Shanghai, is a comprehensive platform-level technical enterprise with independent intellectual property rights. Based on the persistent commitment and long-term investment and accumulation of values and corporate culture in the past 17 years, it is currently independent in the sensor, data transmission equipment, data acquisition equipment, data analysis, automatic measurement (mapping) system, and high-precision motion control and intelligent control. It can provide value-oriented, full-industry chain level complete solution for customers.